one that would create a generation Of enlightened and intellectual youth in a country that needed it more than others. Dr. Aafia earned her bachelor’s degree from MIT and earned her doctorate from Brandeis University. Her doctoral thesis was “Learning through Imitation” in which she included her research on improving learning techniques for children. She was totally dedicated to her children and her academic studies revolved around how children learn. Unfortunately, Dr. Aafia became a victim of domestic violence during her marriage. In 2002, Dr. Aafia’s husband moved the family to Pakistan and soon divorced her while she was pregnant with the couple’s third child. In 2003, Dr Aafia became a victim of a rendition operation was kidnapped along with her little kids. Currently languishing in a US jail at FMC Carswell military base where her life is in constant threat. In March 2003, Dr. Aafia and her three children, Ahmad (boy), six years old and an American citizen, Maryum (girl), four years old and also an American citizen, and baby Suleman (boy), six months old, kidnapped by unknown authorities in Karachi, Pakistan. On March 31, 2003 it was reported by the Pakistani media that Dr. Aafia had been arrested and turned over to representatives of the United States. In early April, this was confirmed on NBC Nightly News, among other media outlets. There was communication to the mother of Dr. Aafia from purported “agencies” that the family members should be quiet if they want to see Aafia returned alive. the Pakistani government to free Dr. Aafia or to even admit that they were then detaining her. With prisoner 650 was sent by various human rights activists world wide echoed. Plot that makes one shudder. What Evidence , Investigation has uncovered? That Dr. Aafia was (and is) an innocent person who was abducted for money or based on false allegations or false conclusions derived from an unknown source. And confessed to the heinous crime on the behest of her ex husband and the regime that stripped pakistan Off its dignity by selling its own citizens. That documents incriminating Dr. Aafia are either false documents or produced under torture or threat of harm to her children. That the Afghan police were looking for Dr. Aafia and her son based on a description given by an anonymous tip with a shoot on sight Order on the day she was detained in Ghazni. That had Dr. Aafia been shot on sight on suspicion of being suicide bombers, this would have led to a convenient closure of the case of Aafia Siddiqui at a time when a massive outcry from international community and a petition for habeas corpus was pending in the High Court of Pakistan in Islamabad. (which would include anyone working with them) to release her or to reveal her whereabouts. That Dr. Aafia, who spoke no local language in Ghazni, was dressed so conspicuously in a manner to be easily identified and shoot on sight as a (falsely-accused) suicide bomber as a part of someone else’s plan. The forensic and scientific evidence presented during the trial in New York proved that Dr. Aafia could not have committed the crimes for which she was charged, still the the judges closing arguments jury disregarded the evidence and chose to agree with the prosecution due to fear and prejudice. 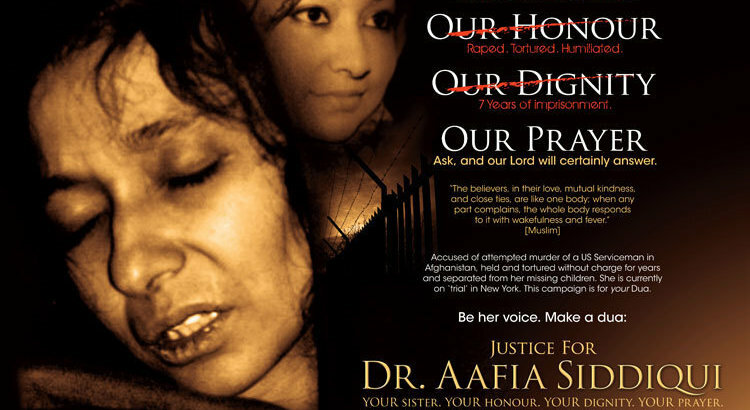 What Dr. Aafia’s detractors want? We are asked to believe that Dr. Aafia, a respectable Pakistani woman in all ways, has links to terrorists from Pakistan; (NO terrorism charges against her)was voluntarily hiding under cover with three children acting as a terror field operative while at the same time leaving her family to believe for five years that she and her three children were dead. We are asked to believe that Dr. Aafia arranged this just after her father died, after finding out her husband cheating on her marriage was disintegrating, and after leaving her widowed mother alone in Pakistan. It is absolutely not plausible and does not even fit the traditional profile by law enforcement of female or male terrorists from that part of the world. In February, 2010, Dr. Aafia was tried and convicted in a US Federal court on charges of attempted murder and assaulting US servicemen in Ghazni, Afghanistan. The official charges against Dr. Aafia were that she assaulted U.S. soldiers in Ghazni, Afghanistan, with one of the servicemen’s own rifles, while she was in their custody, waiting to be interrogated by them. There were NO terrorism charges against Dr. Aafia. 1.No jurisdiction to try the case in the US. This was a result of a rendition operation. 2. Many rulings by the judge that strongly favored the prosecution and prejudiced the case against the defense. 3.These ranged from allowing much hearsay evidence and jury instructions that favored the prosecution. 4. In addition, Dr. Aafia was not represented by lawyers of her choosing and faced constant innuendos of terrorism when she was not charged with any such offence. 5. As a result of Judge Richard Berman’s framing of the case in a negative light, Dr Aafia was convicted despite ALL physical and forensic evidence that showed that she could not have committed the acts she was charged with. 6. On September 23, 2010, Dr. Aafia was sentenced to 86 years in prison by Judge Richard Berman who overruled the jury’s determination that there was any pre-meditation. The judge also added enhancements that were not part of either the charges against Dr. Aafia nor part of the conviction. After her sentencing, Dr. Aafia aasked that people not take any revenge or get emotional. She asked that those who have wronged her be forgiven as she forgave Judge Berman. Dr. Aafia remains imprisoned, now at the notorious Federal Medical Center (FMC) in Carswell, Fort Worth, Texas where she is kept in the Special housing unit (SHU) which is the most severe confinement category. She is still not allowed communication with anyone she trusts, including family members. 7. Being a Muslim her religious book the Quran is desecrated, her clothes stripped, food urinated Upon and what could be a worse form of human coercion than tearing away little children from their mother And then threaten the mother of her children's safety ? Dr. Aafia’s oldest son, Ahmed, who is a U.S. citizen by birth, was found in an American detention Centre , Afghanistan after public pressure and, in late 2008, was reunited with Dr.Aafia’s sister in Karachi, Pakistan. Dr. Aafia’s daughter, Maryum, also a US citizen by birth, was recovered in April 2010 and dropped off in Karachi after being missing for 7 íyears. She was traumatized and spoke only American accented English. Dr. Aafia’s youngest child, Suleman, a boy who would now be about 12 years old, remains missing; and is feared dead. What Supporters and Family Seek? Family and supporters are asking the U.S. government to repatriate Dr. Aafia back to her home in Pakistan. The Pakistani government has formally made this request as this matter has become a major public issue and has support across Pakistani political and social spectrums. Supporters and people of conscience should press government officials to get Dr. Aafia reunited with her family as soon as possible. Aafia and her family seek no revenge as their faith is in vengeance is mine saith The Lord . Aafia's case Has become a glaring example Of thousands suffering from rendition operations, illegal detentions, false a Accusations and torture tactics that put barbarism to shame. Dr Aafia’s family and supporters still have hope in fair minded peoples commitment to mercy and justice to raise their voices with theirs so it be heard in the corridors of power. To help end the violations of basic human rights and let freedom ring. Justice for the past, for all Dr. Aafia has suffered, is hard to imagine.All that is asked for the future is for some measure of correction. If Dr. Aafia is repatriated, perhaps she can pick up some fragments of life with her family. We ask people to look into this case themselves, and to do so with an open mind. There is a lot of information out there on the Internet, and in the media. Many of the stories demonize Aafia, while some raise her to sainthood. Aafia is neither demon nor saint. Aafia is simply a mother, daughter and sister with a dream, trapped in an extraordinary nightmare. resulting "terror war" not happen to other innocents anymore.